When the relief stint came to an end, I was asked to stay on board to join the Mike Fackrell band (Pictured) as their trumpet player. It was during one of the Golden Odyssey's Asian Cruises that I happened to be in Singapore and became friendly with piano player Paul Gostelow. He asked if the band would be interested to take up a 6-month residency in Taiwan. Whether it was my Geordie accent or my poor geography .. I do not know. I urged our the bandleader Mike Fackrell to contact Paul asap as we had a fantastic chance to work at a nightclub in Thailand! It was paradise. After a 10 minute conversation, Mike called me into the room. I will never forget Mike's face and his words .."Colin my boy, you got your "T's" mixed up".The job offer is for Taiwan not Thailand !! So in 1987, the band left the ship we went on to work in Taipei, Taiwan. It was a 6 month contract at a nightclub. It was a little like going back to the days of the speakeasy but more on the posh side and very shady. The drummer in our band was Steve Rushton who went on to take Ronnie Varrells place in the Syd Lawrence orchestra. When the 6 month contact came to and end. most of us decided to stay on in Asia, and Taiwan was a good a place as any to start. In the 1980's Taiwan was a bit like the wild west. I boldly decided to form my own band. With a Canadian trumpet player Tom Shorthouse, and some local talented Filipino musicians we called ourselves "Foreign Affairs". I played the trombone with this band. Our repertoire was some jazz, pop and slapstick comedy. The locals loved it. I also formed a Dixieland Band "The Ploughman Stompers" plus the "Tom Colin's Big Band" for the Farmhouse pub for Sunday afternoon jam sessions. The music scene was lively and the bands were very much in demand. Life was good. It was here in 1988 that I met my lovely wife Jeannie who is from Singapore, but was working in Taiwan at The Ritz Hotel. She tried often to book bands for events at the hotel. I moved to Hong Kong in 1993, and Jeannie followed a few months later after completing her contract. It was fairly easy for her to get a job in one of the many hotels in Hong Kong. My first summer in Hong Kong saw me working for Ken Bennett's German Oom-pah band in the daytime, and some Sunday nights at Ned Kelly's. At the end of the summer, it was odd gigs here and there. Jeannie was still in Taiwan completing her contract. I was a stranger in Hong Kong, trying to find a start. It was my good fortune to meet up with Lt-Col David Kerr who was the CO at the Royal Logistic Corps in Hong Kong. He suggested that with the imminent handover in 1997, more units were being disbanded and it would be a great spot for a small. mobile and affordable band. 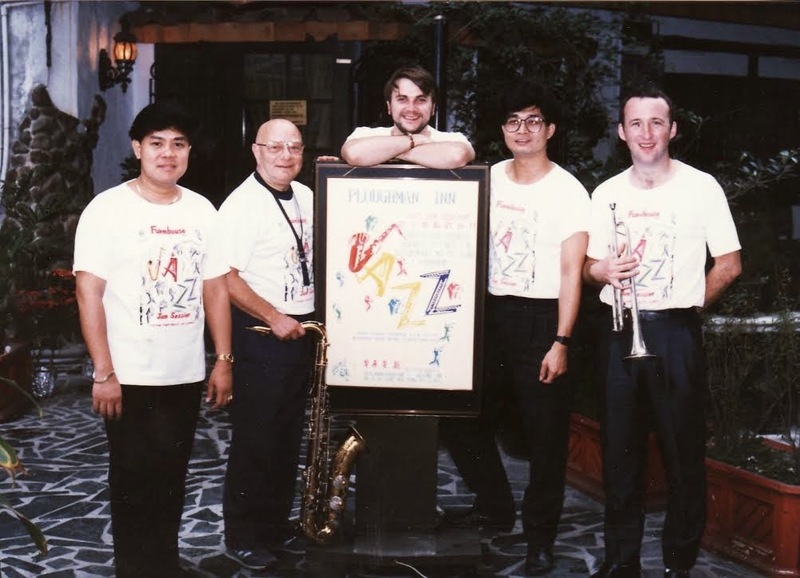 Hence in 1993, our quartet "The China Coast Jazzmen" was formed. There were numerous events over the next 4-5 years and the band made quite a name for itself. It was somewhere during this period (1994-5) when I was once again offered a cruise of a life time - a chance to join the old band for a 2 month South American cruise on the SS Rotterdam. It was a lovely old steamship. It was a memorable trip, and where I had a chance to meet Buddy Greco and have a good chat about his days with Benny Goodman. Jeannie ran the business and the bands during my absence and kept things afloat. With the handover approaching, Ken Bennett decided to leave Hong Kong. It was now my time. That year, I was asked to be the full time bandleader at Ned Kelly's. It was also the year when our tender to supply bands to Ocean Park was accepted. Added to that, the Peninsula Hotel found our old folio (from a couple of years before) and I was asked if we could supply a quartet for their lobby. 1997 was a good year!